When medication changes the structure of the jaw, oral implant failure can be a side effect. 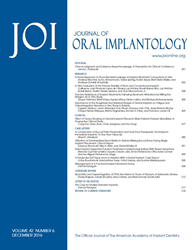 A recent article in the Journal of Oral Implantology examines the effects of bisphosphonates on dental implants in women with osteoporosis. Journal of Oral Implantology – Postmenopausal women often suffer from osteoporosis, resulting in a loss of bone mass and strength. To combat this disease, many women take bisphosphonates (BPs), a group of medicines that help slow or prevent bone loss. However, BP therapy in terms of successful dental implantation has not been well documented. Dental implantation tends to be highly predicative in terms of effectiveness, but when medication is introduced that will change the overall landscape of the mandible (jawbone) structure, implant failure can be a side effect. Researchers from the Kanagawa Dental University Hospital and the Tokyo Medical and Dental University have recently performed a study focused on the use of BP therapy and its effect on the quality of the mandible. The researchers evaluated the bone mineral density and cortical bone thickness (the outer layer bone thickness) of the mandible, as well as how long-term BP therapy effected early implant failure. This study included 25 female patients, at least 60 years of age, with a previous osteoporosis diagnosis, and who underwent dental implant surgery in the mandible between January 2010 and March 2013. The patients were divided into two groups: (1) the BP group consisted of 11 patients who had been taking BPs for more than one year, and (2) the remaining 14 patients were in the non-BP group and had been prescribed a type of hormone therapy. The patients were compared using several computed tomography (CT) scans of their mandible to gauge bone mineral densities, cortical bone thickness, and the effect that the duration of BP therapy had on these two factors. The researchers found that in the BP group, 11 patients with a total of 25 implants had three (11.1%) of those implants fail in three (25%) different patients within one year. In the non-BP group, the 14 patients had a total of 28 implants. Every implant in the non-BP group survived. It was also found that the BP group had a higher bone mineral density than the non-BP group, and those patients with a longer duration of BP therapy had increased cortical bone thickness. Overall, the researchers believe that BP use is correlated with increased bone mineral density and cortical bone thickness. This study was limited by both its small population size and the question of whether or not the medications used in the non-BP group had an effect on the mandible as well (which was not tested). However, the researchers have found that BP therapy does impact the mandible, and clinicians should be mindful that remodeling of the mandible could occur in patients receiving BP therapy, prior to beginning implant treatment.